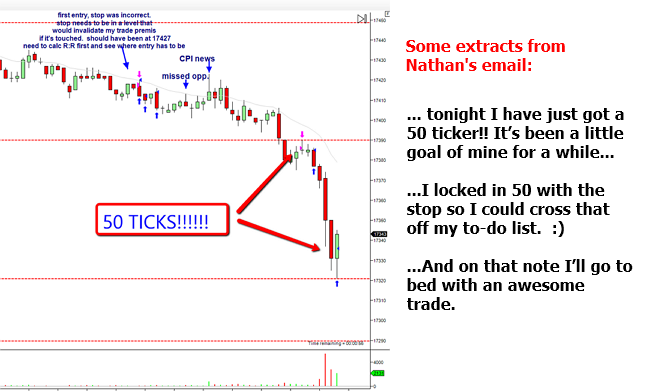 In a recent article we discussed an email I received from a trader, Nathan, excited by the fact that he just got his first 50 tick winner… a goal he'd had set for quite a while. This was perfect timing for me, as it's a great example of "Trader Motivation Hack – Number 2", which was planned for release today. 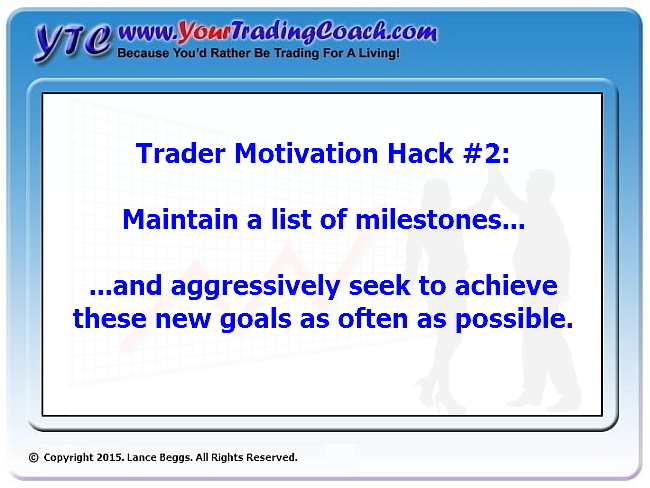 This hack is simple… maintain a list of milestones… and aggressively seek to achieve these new goals as often as possible. But always make them stretch your levels of skill and knowledge, just beyond what you've achieved before. And reward yourself when you get them. Keep them visible! Maybe put them on your wall. Those you've achieved remind you of the great progress you've made so far. And those you're yet to achieve will motivate you to push for the next reward. So you've achieved a 50 tick winner? Nice work. Mark that one achieved. Reward yourself. And amend it to now seek a 60 tick winner. 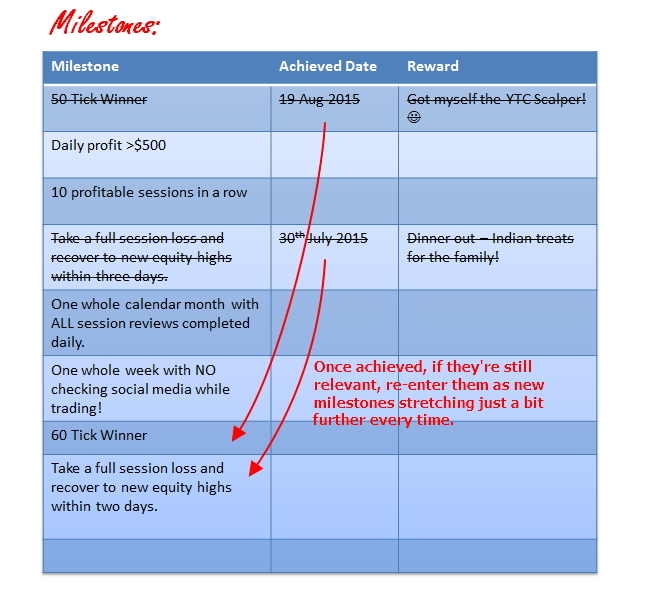 Of course, you'll need to customise your list of milestones to suit your own circumstances. Make them all outcome focused if you prefer. Or process focused. Or a mix of the two. Whatever you find more motivating. Pre-enter the rewards if you feel that will help you stretch yourself to make the target. Customise it however you want. But be sure to try it. It's simple. And it works surprisingly well as a motivation tool. This weekend… Set up your milestones list. Make the first entries simple and achievable, but just beyond what you've managed before. And think of some rewards that might help push you to achieve these milestones. Thanks Stu! 🙂 Much appreciated.